Ever since 19.1, when I install Arco B plasma, I select Breeze Dark as my look and feel pack (or as theme) it doesn’t go fully dark like in previous editions. It will have dark window borders but inside the windows it will look like the regular Breeze theme. It happens on plasma or plasma minimal, on metal or in a VM. I have reinstalled 18.12 and then just get it up to date from there and that works. Any ideas or thoughts on what could be happening? Last edited by Arco Polo on Wed Mar 13, 2019 5:36 pm, edited 1 time in total. Give us some images and procedure what you do so we can recreate it. 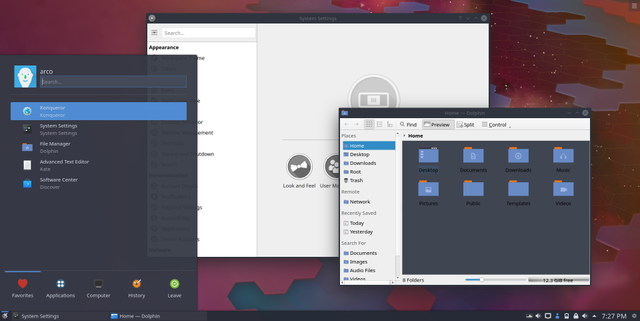 The Breeze theme is not from ArcoLinux or Arch Linux. They may have changed it. I will certainly send some pics, once I spin up a 19.2 VM. I seem to remember that openSuse tumbleweed or Kde neon didn’t have the issue... I wonder if it is a 5.15 beta issue. Everything is in continuous change. This happens on VM or metal. Before and after system update. The screenshot was from an ArcolinuxB plasma minimal install in a VM, after full system upgrade. I thought it was a 5.15 beta issue but 5.15 has been released and even has a point release. But according to pamac, the correct packages are installed. Last edited by Arco Polo on Wed Feb 27, 2019 2:03 am, edited 3 times in total. Having the same issue... Manjaro KDE works using breeze dark (as well as other plasma distro's). I will spin up a vm tonight, and if all goes well, I will install on metal. Qt5ct is bad news as is kvantum on Plasma. Solved with the 19.03 release. And thank you for the rabbit holes I got lost down reading about kvantum and Qt5ct.